Pininfarina's Nido EV has made its road debut in Rome: Paolo Pininfarina and the city's Mayor Gianni Alemanno drove to the Quirinale where the were received by the President of the Italian Republic Giorgio Napolitano. Celebrations of the 80th anniversary of Pininfarina have continued in Rome with the debut on the road of the Nido EV. 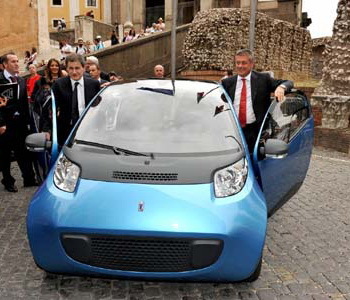 At the Campidoglio the electric prototype developed by Pininfarina was presented by Chairman Paolo Pininfarina to the Mayor of Rome, Gianni Alemanno. Together, aboard the Nido EV, they reached the Quirinale, where the President of the Italian Republic Giorgio Napolitano received the Pininfarina family and hosted in the gardens of the Palace the 50 cars taking part in the Concours d’Elegance Bovet Italia Classica 2010. The Nido EV is the first running prototype of the "Development Program Nido", an electric car project entirely designed, engineered and built by the Style and Engineering Center Pininfarina at Cambiano, Turin. 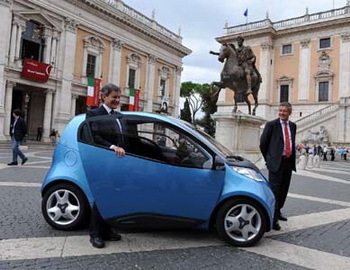 The Nido EV has now faced for the first time an urban route with two exceptional passengers on board: the Mayor of Rome Gianni Alemanno and the Chairman Paolo Pininfarina. Through the centre of Rome, the Nido EV left the Piazza del Campidoglio to reach the Quirinale where it was displayed in the courtyard of the Palace together with the classic cars participating in Italia Classica, which this year was dedicated to the 80 years of Pininfarina and the 100 years of Alfa Romeo. This new vehicle is one outcome of the pioneering decision taken by Pininfarina three years ago, to focus on sustainable mobility, approaching it from various angles: not only the adoption of a hybrid or electric drivelines, but also research focusing on reducing consumption and “wheel to wheel” emissions, the use of alternative materials that are lighter and recyclable, active and passive safety, and IT, which will have to combine the sustainable use of means of transport with intelligent traffic management. The exterior design of the new Nido EV takes up and updates the lines and volumes of the concept of the same name that in 2004 won the award for the Most Beautiful Car in the World in the Prototypes and Concept Cars category, the Compasso d’Oro 2008 and a place in the temple of modern art, the MoMA of New York. On the other hand, the interiors of this first Nido EV project are still those of a technical prototype, with no attempt at stylistic research. The Nido EV prototype is a veritable laboratory designed both to explore the electrification of a small city car and to develop a modular floorpan. The body structure of this first prototype is a tubular steel frame, while the final version will have an aluminium space frame. The structure was designed to adapt to four different, completely electric or hybrid vehicles: 2-seater, 2+2, pickup and light van. The Nido EV was not the only car in Rome to represent the values that Pininfarina has based its success on, unchanged from the thirties to the present: the centrality of design, aesthetic sense that can create timeless beauty, a constant innovation, the strength of a tradition that combines industry, technology and design research. In the gardens of the Quirinale was also displayed the firm's newest concept car, 2uettottanta, a 2-seater spider based on Alfa Romeo mechanicals that was made to celebrate the 80th anniversary and, at the same time, to pay homage to the centenary of Alfa Romeo, and Florida II considered a design milestone: this 4-seater coupé was realised in 1957 in a single unit and was the personal car of the Founder Battista "Pinin" Farina. Florida II, along with masterpieces such as the Cisitalia 202 and the Lancia Aurelia B24, is part of the recently inaugurated Pininfarina Collection based in Cambiano. Many of the historic cars selected by the Organizing Committee of Bovet Italia Classica 2010 were also masterpieces of the past designed by Pininfarina for brands like Ferrari, Maserati, Alfa Romeo, Lancia. 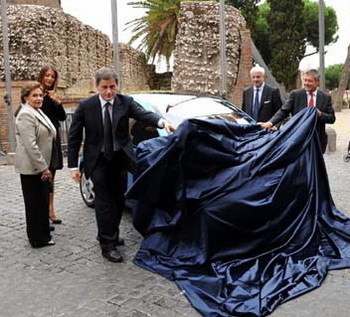 During the ceremony at the Quirinale Paolo Pininfarina delivered to President Napolitano the Lifetime Achievement Award for the Presidential Lancia Flaminia, another milestone designed by Pininfarina, which is still today in active service as the oldest State parade car in the world. Sponsors of the event, the Swiss watchmaker Bovet, presented the Tourbillon Eighties, the chronograph designed by Pininfarina and realised in just 80 pieces.